VietJet Air has announced a major network expansion that will make it Vietnam’s largest low-cost carrier, overtaking Jetstar Pacific, by the end of 2012. VietJet is also poised to beat rival Jetstar Pacific in becoming the first Vietnamese LCC to operate international services. VietJet, which will expand its domestic network from five to nine destinations in Nov/Dec-2012, is looking at launching its first international route – possibly Ho Chi Minh-Bangkok – in late 2012 or early 2013. Jetstar Pacific has been focusing this year on fleet renewal rather than expansion but is planning to resume expansion in 2013, ending a hiatus of four years in which growth was paused due partially to internal uncertainty. The carrier began a more promising new chapter earlier this year after a 70% stake was transferred to Vietnam Airlines, which previously had been looking at launching its own LCC subsidiary (Jetstar owns the remaining 30% stake in Jetstar Pacific). But Jetstar Pacific may struggle to keep up with much newer VietJet, which is likely to continue expanding at a faster pace than Jetstar Pacific. VietJet launched services in late Dec-2011 but has expanded quickly and by its first year anniversary will operate 22 daily roundtrip frequencies on nine domestic routes. VietJet currently operates five domestic routes and an average of 10 daily frequencies. But the carrier is adding capacity on four of its routes on 16-Oct-2012, at which point it will operate 16 daily frequencies. On 04-Oct-2012 VietJet announced plans to add another four routes in Nov-2012 and Dec-2012 – Ho Chi Minh to Hue, Phu Quoc and Vinh and Hanoi to Dalat – and expand its total number of daily frequencies to 22. Jetstar Pacific had a big head start, becoming Vietnam’s first LCC in 2007, when the carrier (formerly known as Pacific Airlines) was rebranded and adopted the low-cost model following investment from Jetstar. But Jetstar Pacific currently only operates four domestic routes and 15 daily roundtrip frequencies, based on schedules on Jetstar’s website. Jetstar Pacific for now is only planning to add two frequencies for the remainder of this year (both of which will take effect in latter half of Oct-2012), giving the LCC five domestic routes and 17 daily roundtrips. Jetstar Pacific currently accounts for about 14% of capacity in Vietnam’s domestic market while VietJet accounts for 9%. VietJet currently offers about 25,000 weekly seats but by late Dec-2012 – once all four of its new routes are launched and capacity is increased on most existing routes – it will offer over 55,000 weekly seats in Vietnam’s domestic market. This will give VietJet starting the last week of 2012 (24-Dec-2012 to 30-Dec-2012) an estimated 16% share of Vietnam’s domestic market, second only to market leader Vietnam Airlines, while Jetstar Pacific’s capacity share will decline to an estimated 13%. Government-owned flag carrier Vietnam Airlines is projected to account for about 68% of domestic capacity in Vietnam at the end of Dec-2012, down from about 73% currently. This decrease of 5ppt comes despite the fact that Vietnam Airlines is planning to expand domestic capacity by over 15% for the upcoming northern hemisphere winter season (from just under 200,000 weekly seats to about 233,000), according to Innovata data. 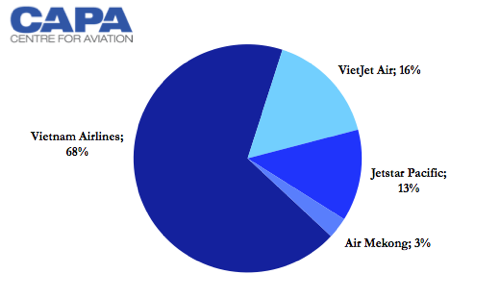 Vietnam Airlines already has seen its share of domestic capacity slip by 5ppt over the last year from about 78% in Oct-2011 to 73% in Oct-2012, according to Innovata data. Jetstar Pacific also has been steadily losing market share over the last 14 months as the carrier has dropped three routes and reduced capacity on others. Back in Aug-2011 Jetstar Pacific accounted for 18% of capacity in Vietnam’s domestic market and offered just under 54,000 weekly seats, according to Innovata data. But cuts implemented in Sep-2011 resulted in Jetstar Pacific's share of the market dropping to 15% in Oct-2011. Jetstar Pacific currently offers just over 37,000 weekly seats, giving it about a 14% share of total domestic capacity in Vietnam. This will increase slightly over the next couple of months, to just under 43,000 weekly seats, as the carrier resumes Hanoi-Danang service and adds one additional frequency on Hanoi-Ho Chi Minh and as it continues to transition from 168-seat Boeing 737-400s to 180-seat A320s. Jetstar Pacific currently operates four A320s and three Boeing 737-400s. The carrier placed into service two of these A320s in 3Q2012, allowing it to phase out two 737-400s. Jetstar Pacific plans to place into service another two A320s during 4Q2012, but these again will be used for replacement rather than growth, resulting in an end-2012 fleet of six A320s and one 737-400. 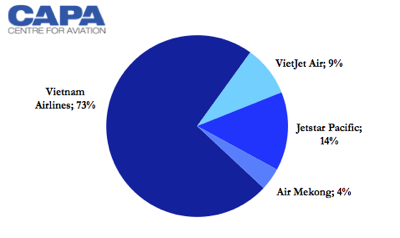 Jetstar Pacific seems to have average aircraft utilisation rates in 4Q2012 significantly less than VietJet, which could be a reflection of maintenance on the 737-400s that is required prior to their return to leasing companies. Jetstar Pacific should theoretically be able to boost capacity closer to VietJet's levels at the end of 2012 or at the beginning of 2013 as by then it should have six A320s in service. A Jetstar Pacific executive told CAPA in Jun-2012 that the carrier is expected to resume growth in 2013. The carrier now aims to lease three A320s in 2013, one of which will replace the last 737-400 while two will be allocated for growth. VietJet currently operates three 180-seat A320s but is planning to place into service three additional A320s during 4Q2012. VietJet’s current business plan envisions a fleet of 15 A320s by the end of 2015, which would involve adding aircraft at a rate of three per annum in 2013, 2014 and 2015 (compared to the planned two aircraft per annum rate at Jetstar Pacific). The three additional aircraft VietJet is placing into service during 4Q2012 will allow the carrier to launch the four new routes (in Nov-2012 and Dec-2012) as well as increase frequencies across its existing network (primarily in Oct-2012). On 14-Oct-2012 VietJet will use its fourth aircraft to add a second flight on its Hanoi to Nha Trang and Danang routes (both of which were launched in 2Q2012) and a third daily flight on Ho Chi Minh-Danang (launched in Apr-2012). VietJet also plans to again increase capacity on its first route and the country’s largest route, Ho Chi Minh-Hanoi, with a seventh daily frequency to be introduced on 14-Oct-2012 and an eighth daily frequency to be added by Dec-2012. VietJet originally increased capacity on Ho Chi Minh-Hanoi to eight daily flights in Apr-2012 but is temporarily now operating only four to five daily frequencies on the route (as it is now the low season and VietJet needed to free up capacity for other routes before its fleet is expanded). VietJet currently serves five destinations – Hanoi, Ho Chi Minh, Danang, Nha Trang and Haiphong (with Haiphong being the latest addition, launched on 01-Oct-2012). Danang, Vietnam’s third largest city, is the only VietJet destination served from both the capital Hanoi and VietJet’s base at Ho Chi Minh. Dalat, Hue, Phu Quoc and Dalat will all be new destinations for VietJet, expanding the carrier’s domestic network to nine destinations. VietJet will launch service to Vinh on 15-Nov-2012 and Hue on 22-Nov-2012, with both destinations being initially served with one daily frequency from Ho Chi Minh. Ho Chi Minh-Vinh is the only Jetstar Pacific route that is currently not served by VietJet. Jetstar Pacific currently has two daily flights on the route while Vietnam Airlines has three daily frequencies. VietJet on 07-Dec-2012 will become the first LCC to serve Dalat, a tourist town in the highlands of south central Vietnam. On 20-Dec-2012 VietJet plans to become the first LCC to serve Phu Quoc, a popular island near the Cambodian border where a new airport is slated to open in Dec-2012, replacing a current airport that can only handle turboprop aircraft. Phu Quoc and Dalat are currently only served by Vietnam Airlines and small independent regional carrier Air Mekong. While VietJet will likely only operate one daily frequency into both markets (it has not yet set its schedule for Phu Quoc but has started selling one daily flight to Dalat), the impact is significant given the small size of these markets. Dalat-Hanoi is currently served by Air Mekong and Vietnam Airlines with two daily flights each. Air Mekong, which operates Bombardier CRJ900s, provides 1,260 weekly one-way seats while Vietnam Airlines provides about 2,600 weekly seats (it uses Airbus A321s on the route). As a result, VietJet’s one daily A320 frequency will increase total capacity on the Dalat-Hanoi route by about 33%. Ho Chi Minh-Phu Quoc is the largest route for Air Mekong but the carrier has significantly reduced capacity on the route over the last year. Air Mekong also has reduced capacity on most of its other routes, including Ho Chi Minh-Hanoi, which used to be the carrier’s second largest route but become more competitive after the launch of VietJet . 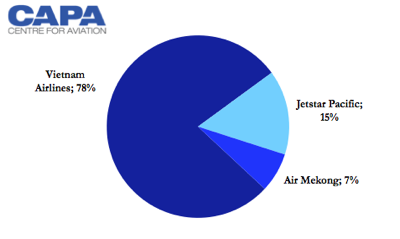 The capacity reductions at Air Mekong have resulted in the small carrier’s share of the domestic market slipping from about 7% in Oct-2011 to only about 4% currently, according to Innovata data. The launch of VietJet in Phu Quoc will likely have a big impact on the carrier. Air Mekong is based at Phu Quoc and is owned primarily by a large travel company with properties on the resort island. US regional airline group SkyWest Airlines also owns a 30% stake in the carrier and supplied Air Mekong its fleet of four CRJ900s. Air Mekong will also be impacted by VietJet’s entry into Dalat as Hanoi-Dalat is now Air Mekong’s second largest route. Air Mekong still operates in four markets where there is no LCC competition – Qui Nhon, Banmethout, Pleiku and Con Dao. But these are all very small markets that Air Mekong has limited capacity in and faces intense competition from Vietnam Airlines. While Air Mekong’s future seems threatened as VietJet expands, Air Mekong is responding by planning a strategy shift that could see it enter trunk routes with A320s. The carrier’s new management team recently disclosed plans to acquire two A320 family aircraft and use the aircraft to compete operate on Vietnam's three main trunk routes: Ho Chi Minh-Hanoi, Ho Chi Minh-Danang and Hanoi-Danang. But it is unclear when Air Mekong will place into service the A320s: some local reports say as early as Dec-2012 but other reports say May-2013. Air Mekong has begun listing Danang, which would be the carrier’s 10th destination, on its website booking engine but it has not yet begun selling any flights to Danang from either Ho Chi Minh or Hanoi. It is also unclear if Air Mekong will downsize or close its regional operation if and when it takes A320s. Switching to A320s could be a logical move, particularly for the Phu Quoc market where the planned Dec-2012 opening of a new airport paves the way for VietJet’s launch of Phu Quoc services. The new airport will also enable Vietnam Airlines to up-gauge its Phu Quoc flights from ATR 72s to A320s and allow Jetstar Pacific to enter the market (although neither carrier has yet outlined such intentions). But moving to A320s and entering trunk routes could be a risky move for Air Mekong given its relatively small size and positioning between full service carrier Vietnam Airlines and LCCs Jetstar Pacific and VietJet. Air Mekong is not a LCC but is a hybrid carrier as it has adopted some elements of the LCC model (such as charging for seat assignments) while offering some frills. The Vietnamese market offers tremendous opportunities for growth but Air Mekong could be squeezed out as SkyTeam member Vietnam Airlines caters to premium and corporate passengers while the LCCs are positioned to tap into the rapid expected growth of Vietnam’s middle class. Both of Vietnam’s LCCs are also eager to start tapping into Vietnam’s international market as they realise the domestic market could start approaching saturation. While further air travel growth is expected between Vietnam’s three major cities, stimulated by low fares, smaller markets such as Dalat may not be able to support high frequency LCC service. It is no surprise that Jetstar Pacific plans to direct most of its capacity increases to the international market once it finally starts expanding its fleet in 2013. A Jetstar Pacific executive told CAPA in Jun-2012 that the carrier was looking primarily at potential destinations in Southeast Asia and was not interested for now in serving the promising but challenging Vietnam-China market. Possible Jetstar Pacific destinations in Southeast Asia that are under evaluation include Bangkok and Kuala Lumpur. Jetstar Pacific is also considering taking over some of Jetstar Asia’s flights from Singapore to Vietnam. Jetstar Asia currently serves Singapore-Ho Chi Minh with three daily flights and Singapore-Hanoi with four weekly frequencies. Some or all of these flights are operated with Jetstar Pacific traffic rights. Handing the routes to Jetstar Pacific could be an appealing option for the Jetstar Group as the Vietnamese carrier would theoretically have a lower cost base than Singapore-based Jetstar Asia. Jetstar Pacific has a potential advantage over VietJet internationally as it can leverage the existing Jetstar brand. For example other Jetstar affiliates already serve Bangkok and Kuala Lumpur, making it easier and less risky for Jetstar Pacific to enter these markets. There are other significant benefits that come from being an affiliate of a large LCC group, including being able to leverage a common IT platform and the economies of scale that come with a group fleet of about 100 aircraft. But VietJet is confident it can be successful in the international market despite having a local brand that is not widely recognised outside Vietnam. The carrier is also poised to get a head start on Jetstar Pacific by launching international services prior to Jetstar Pacific. VietJet has stated several times this year that it aims to begin international services in late 2012 (although this could slip to early 2013). It also recently stated that it is evaluating Ho Chi Minh-Bangkok as its first potential international route. Ho Chi Minh-Bangkok is currently served by LCC Thai AirAsia with two daily flights. Thai Airways and Vietnam Airlines also serve the route along with Lufthansa, Qatar Airways, Turkish Airlines – all of which have pick-up rights between Bangkok and Ho Chi Minh. Ho Chi Minh-Bangkok is an ideal LCC route given its relatively short flight time (about 90 minutes) and large leisure component. 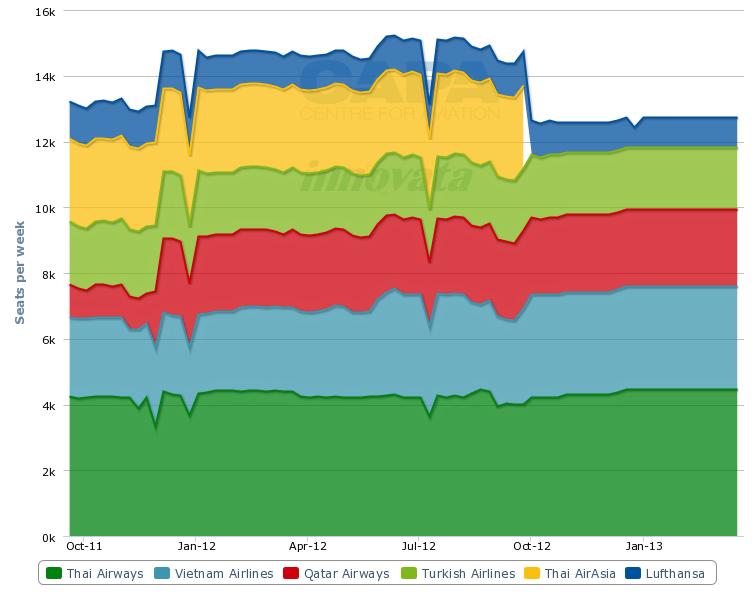 The market could easily support a second LCC as LCCs only now account for 17% of total capacity. But if both Jetstar Pacific and VietJet enter that could prove to be too much capacity. Unlike Jetstar Pacific, VietJet is also looking at potential markets in north Asia including China. A VietJet executive told CAPA in Jun-2012 that the carrier was considering applying for traffic rights to China, Hong Kong, Japan and South Korea as well as within ASEAN. He said VietJet will likely serve only one or two international destinations in the first phase of its international operation. More international expansion is anticipated as part of future phases as the carrier works towards its goal of operating 15 aircraft by the end of 2015.
International flights may be operated from Ho Chi Minh or Hanoi. Currently VietJet bases all its aircraft at Ho Chi Minh but expects to open a second base, and possibly a third base, by the time its fleet reaches 15 aircraft. A lack of space at Ho Chi Minh makes it unfeasible to base all aircraft at VietJet’s headquarters. While VietJet launched as a completely independent Vietnamese-owned airline, it is open to exploring partnerships in future with foreign LCC groups. VietJet originally had a deal with AirAsia Group and was planning to become an AirAsia affiliate with minority ownership from AirAsia. But AirAsia pulled out just a couple of months before VietJet’s launch after the Vietnamese government repeatedly refused to give VietJet permission to use the AirAsia brand. With the removal of an earlier threat that Jetstar Pacific would have to drop the Jetstar brand, the perspective of the Vietnamese government when it comes to the use of foreign brands at local airlines (which supposedly is not allowed) may change. VietJet could evetually again partner with AirAsia or another Asian LCC. Such a tie-up could help VietJet immensely in marketing its international services in other countries. It would allow VietJet to match the cost and economy of scale type of advantages rival Jetstar Pacific has in being part of an LCC group. Vietnam offers tremendous potential but is consolidation needed? VietJet has already succeeded in overtaking Jetstar Pacific in the domestic market by expanding more aggressively and by stimulating demand in the fast-growing local leisure market. Most of the carrier’s passengers in its first year are leisure passengers although VietJet says it is also starting to pursue accounts with small local companies. About 50% of its tickets are sold on its webite, which is a high web penetration figure for Vietnam, with the remainder sold through travel agents and directly via its call centre and ticket offices. VietJet is following a pure low-cost model, charging for the same frills that Jetstar charges for, and relying heavily on ancillary revenues. Operationally the carrier is also trying to keep costs down by following the pure LCC model, with 30min turnaround and average daily aircraft utilisation rates exceeding 12 hours. VietJet expects to carry about 700,000 passengers in 2012. The Vietnamese market offers tremendous growth potential but it remains to be seen whether the market can support four carriers, or five carriers if Vietnam Airlines regional subsidiary VASCO is also considered (VASCO-operated flights fall under the VN code and as a result are included in the Vietnam Airlines capacity and schedule data). Vietnam Airlines has so far been the country's only profitable carrier and its strong position in the local market as well as restrictive government regulations, including fare caps, has made it challenging for other carriers. Jetstar Pacific has not been profitable since its establishment five years ago and VietJet does not expect to be profitable until 2014. The Vietnamese market already had one casualty in late 2009, when full-service start-up Indochina Airlines shut down after operating on domestic trunk routes for only one year. Remaining start-ups VietJet and Air Mekong (which launched service in Oct-2010) do have an advantage in that the Vietnamese government has said it will not authorise – at least for now – any new airlines. Vietnam remains one of the largest growth markets in Asia and if the country’s secondary carriers can successfully enter the relatively under-served international market, there should be enough demand to sustain all the players.